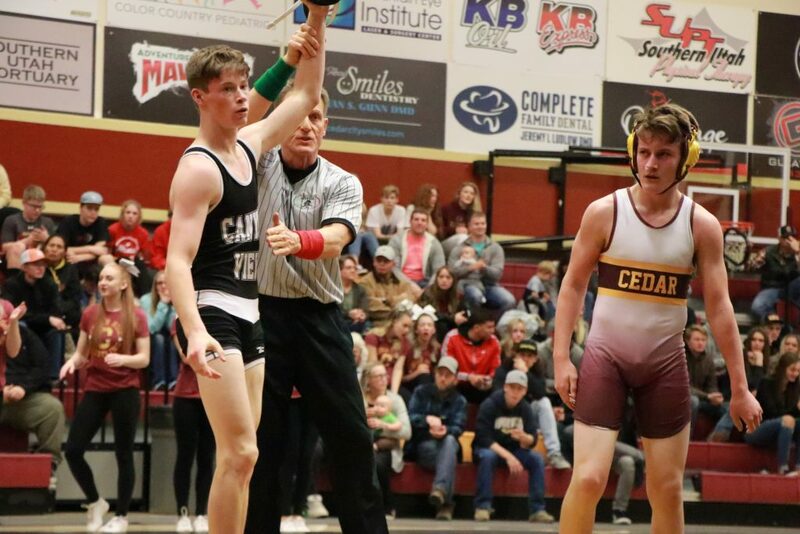 CEDAR CITY — The Canyon View High School wrestling team had a busy but successful weekend last week, starting with a dual match victory at Cedar High School Thursday night. 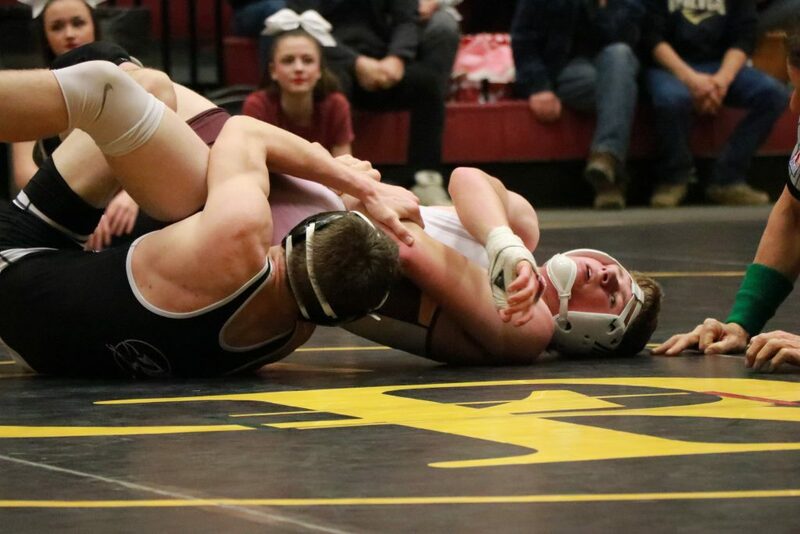 The Falcons then hosted the annual Iron Town Duals tournament on Friday and Saturday, going 6-2 and taking first place in their pool and third place overall in the main bracket. Thursday’s match at Cedar was close, with each team winning six of the 12 matches that were contested. 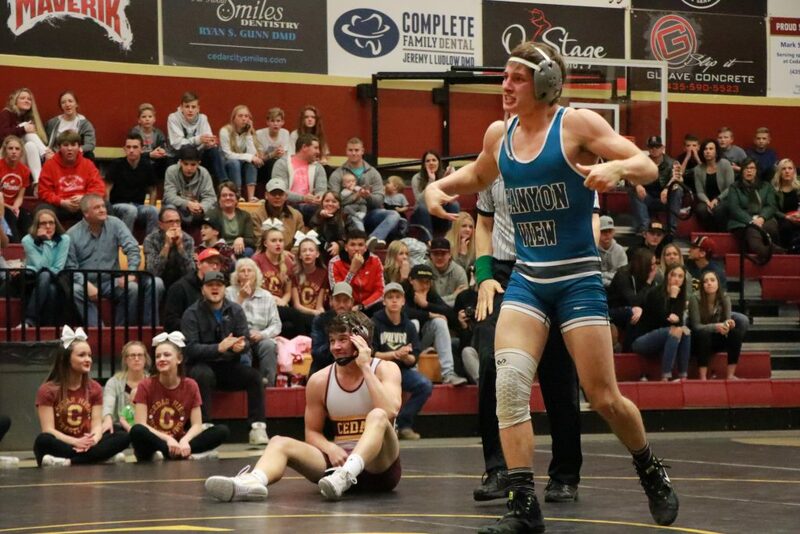 However, Cedar did not field a wrestler in either the 160-pound or 182-pound categories and forfeited those weight divisions; thus, Canyon View escaped with a 45-33 win. 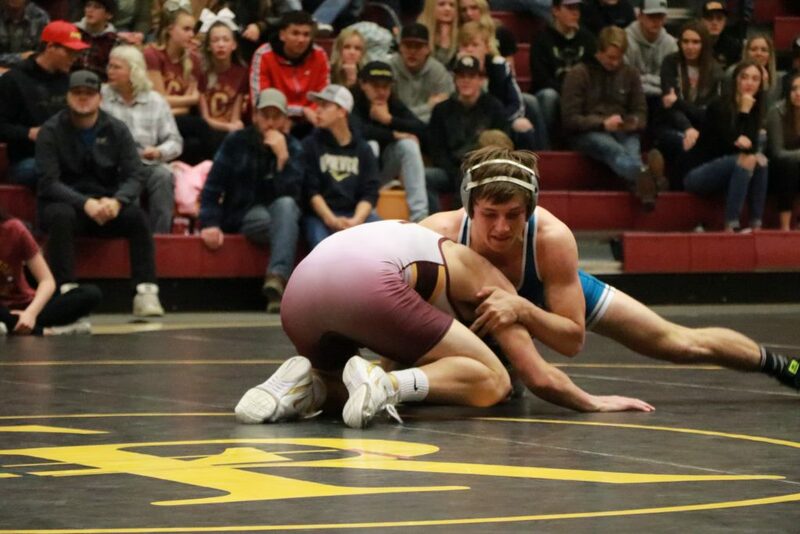 “Cedar’s probably the toughest region opponent we’ll face this year,” said Canyon View head coach Dallas Lowry, whose Falcons remain undefeated in Region 9 dual contests this season. In the Cedar match, the Redmen jumped out to an early 21-0 lead, thanks to wins in each of the four lightest weight divisions. 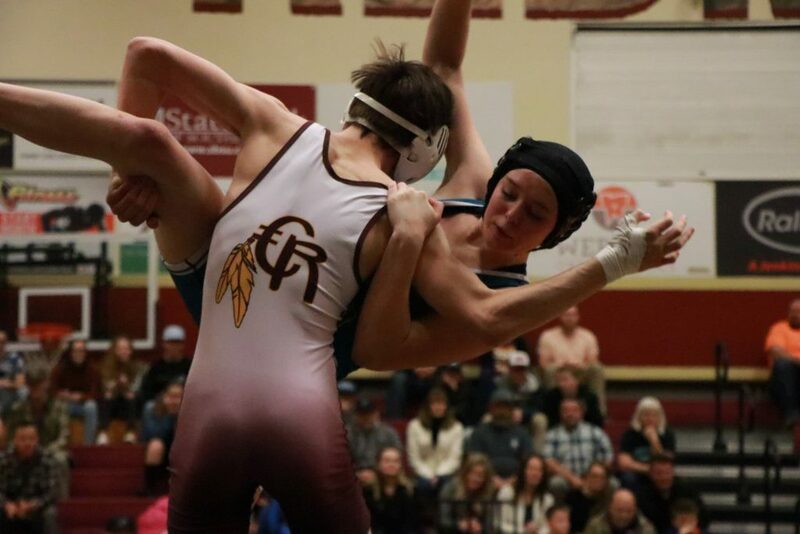 At 106 pounds, Cedar’s Austyn Ennis pinned Canyon View’s Jake Olsen with two seconds remaining in the first period (1:58 elapsed). 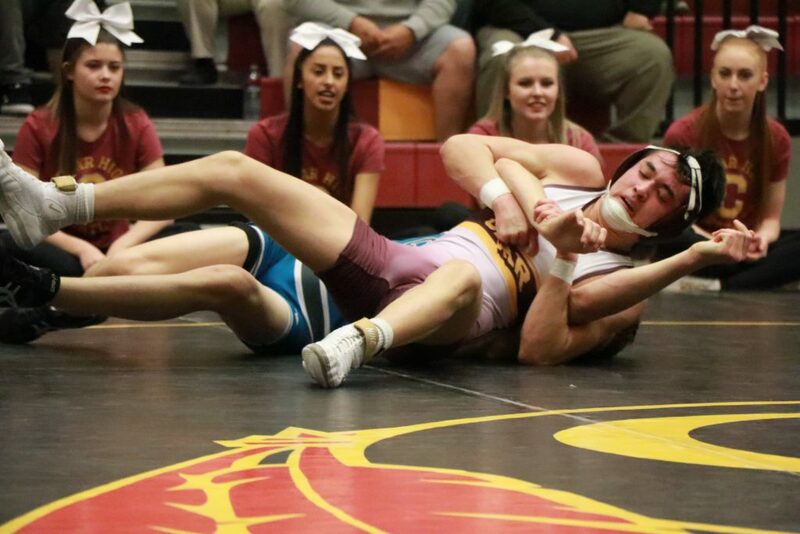 Then, at 113 pounds, Cedar’s McKrae Spencer defeated Canyon View’s only female wrestler competing at the match, sophomore Tessa Campbell, by pin at the end of the first period. Lowry praised Campbell, who is one of a handful of highly dedicated female wrestlers on the Falcons team, for her perseverance. 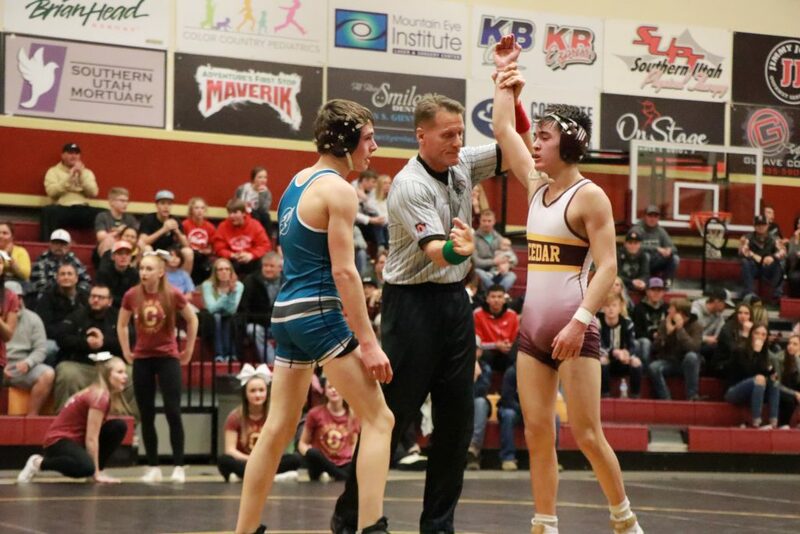 Cedar also won at 120 pounds, as Calvin Slack defeated Canyon View’s Garrett Barney by a 14-11 decision after three closely contested periods. At 126 pounds, Cedar’s Cooper Anderson pinned Canyon View’s Jake Smith midway through the second period. 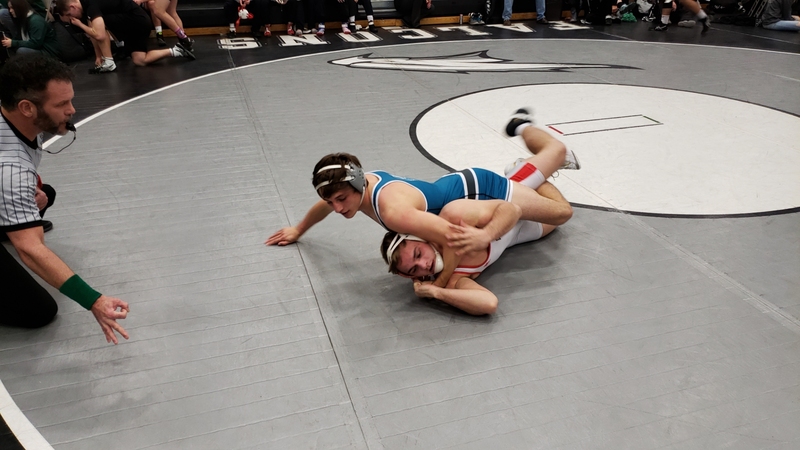 Cole Lake of Canyon View then got the Falcons on the board with a win over Cedar’s James McNett in the 132-pound division. Lake achieved a victory by pin midway through the second period, with 3:18 elapsed. 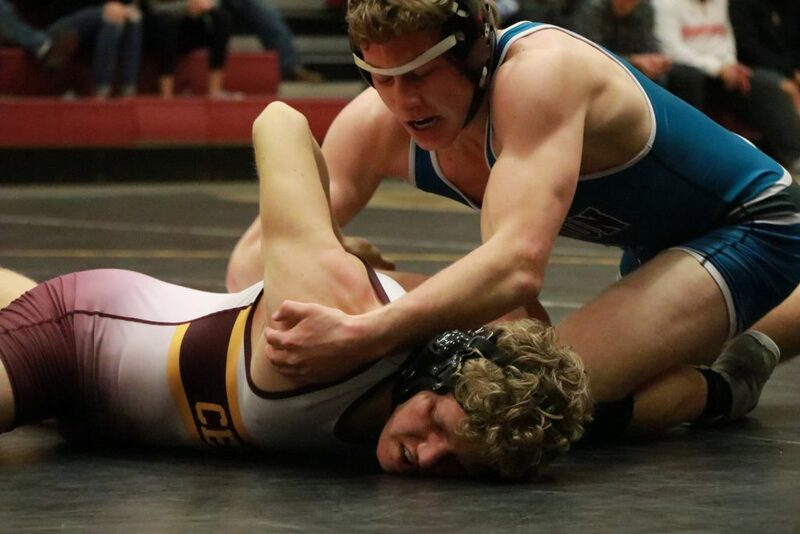 At 138 pounds, Canyon View’s Ethan Taylor then earned three more points for the Falcons, thanks to a 10-3 decision over Cedar’s Tyler Robinson. 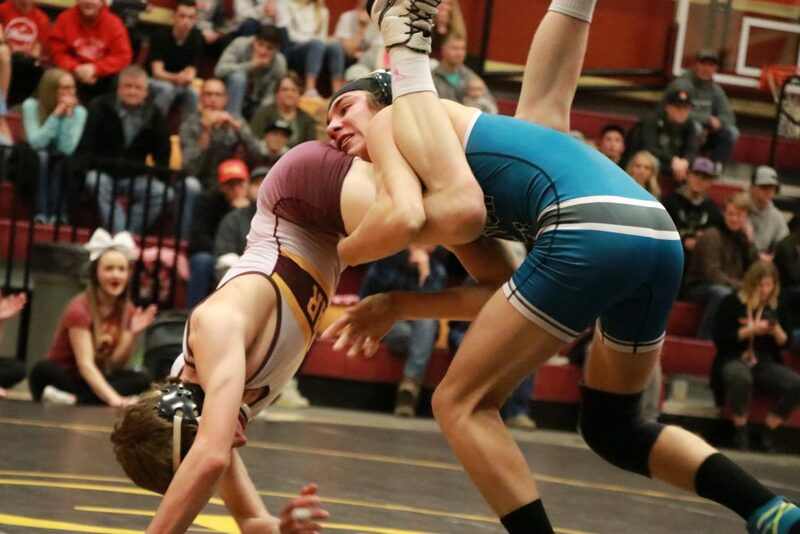 The next match featured Canyon View’s Dawson Stoor vs. Cedar’s Jaiden Kerns at 145 pounds. 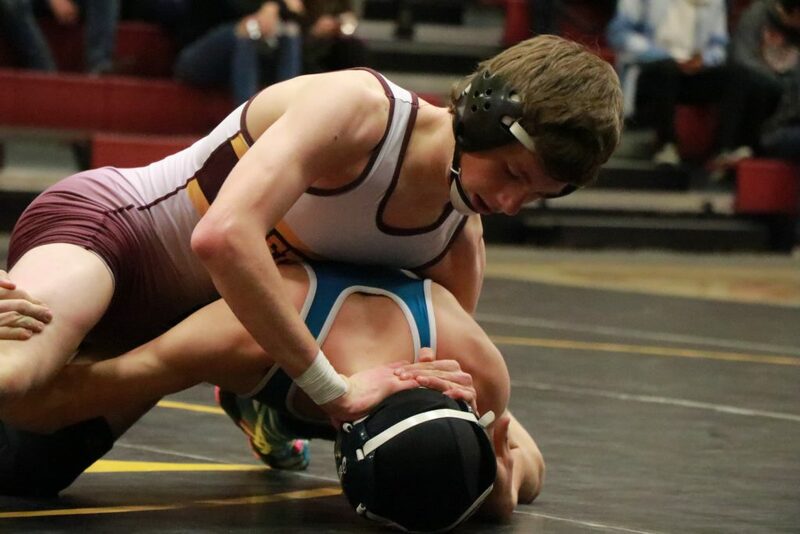 Stoor pinned Kerns 33 seconds into the first round, earning another six points for the Falcons. 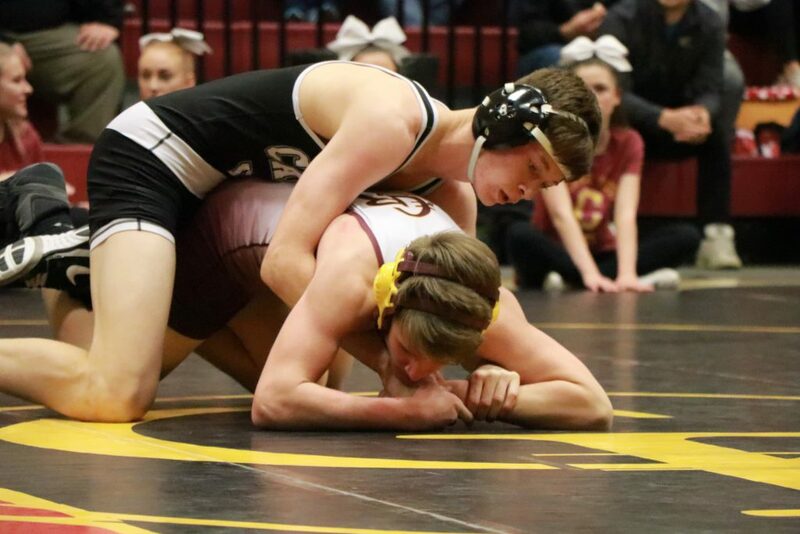 Coach Lowry said that even though Stoor has been wrestling at 145 pounds all year, he plans to move down a weight and compete at state in the 138-pound division. At 152 pounds, Canyon View senior Brady Lowry also won quickly, pinning Cedar’s Michael Anker 24 seconds into the first period. 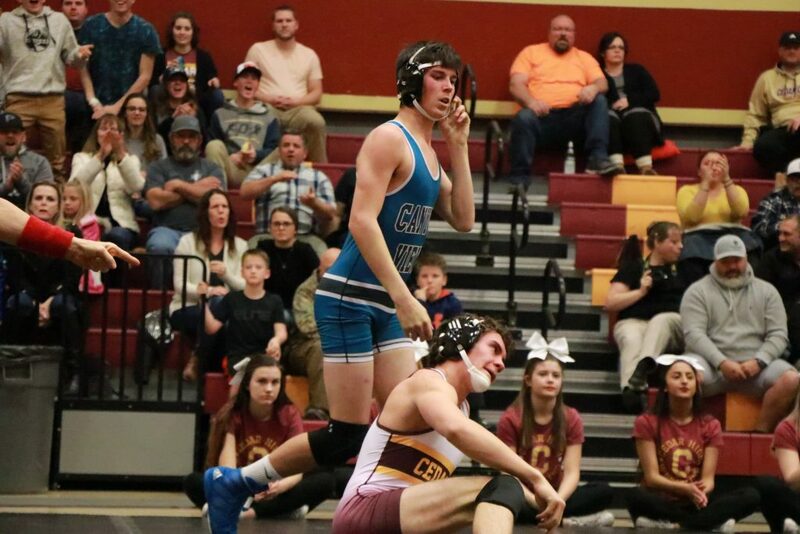 Lowry, the coach’s son, is a returning three-time state placer, having won the state title at 132 pounds as a sophomore and placing second at state at 145 pounds as a junior last year. Brady Lowry’s victory brought the Falcons to a 21-21 tie with the Redmen. At 160 pounds, Canyon View’s Ryan Ball, another returning state placer, was unopposed and thereby won by forfeit. 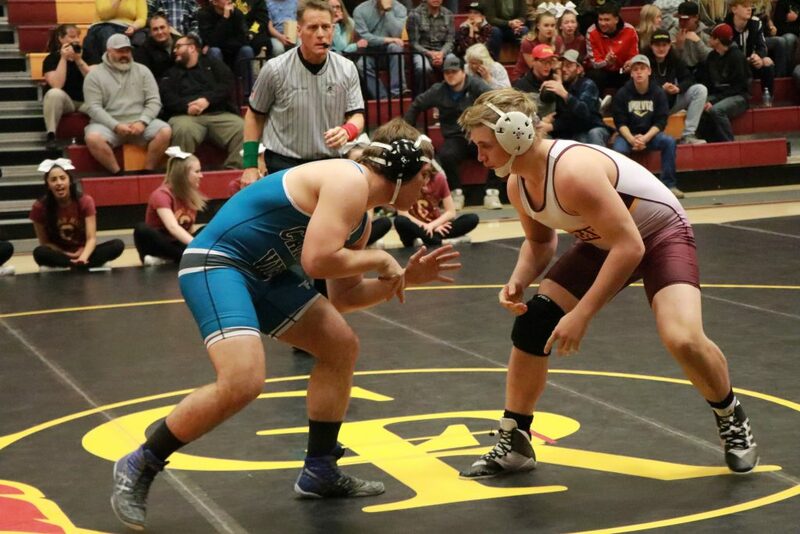 Joining Ball in that same weight division is teammate Colten Shumway, who placed fourth in state last year. 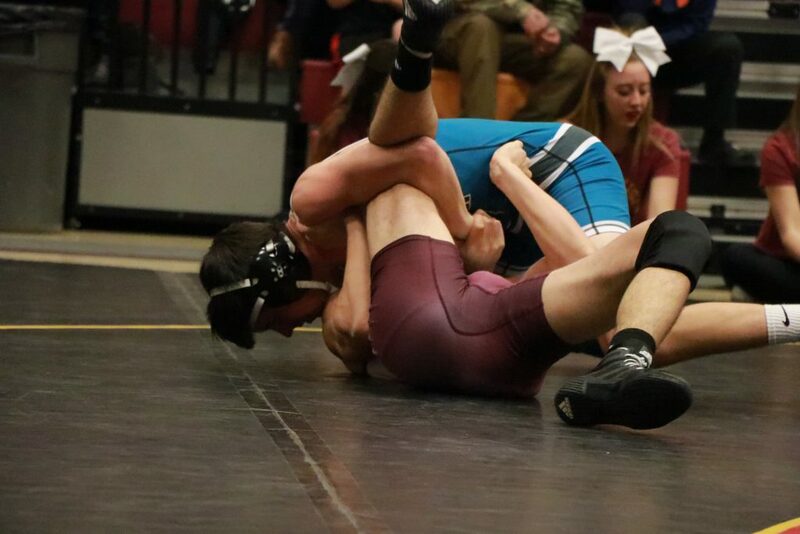 The next match was 170 pounds, where Canyon View’s Braydon Cavalieri defeated Cedar’s Treyton Payne by pin in the closing seconds of the first period. 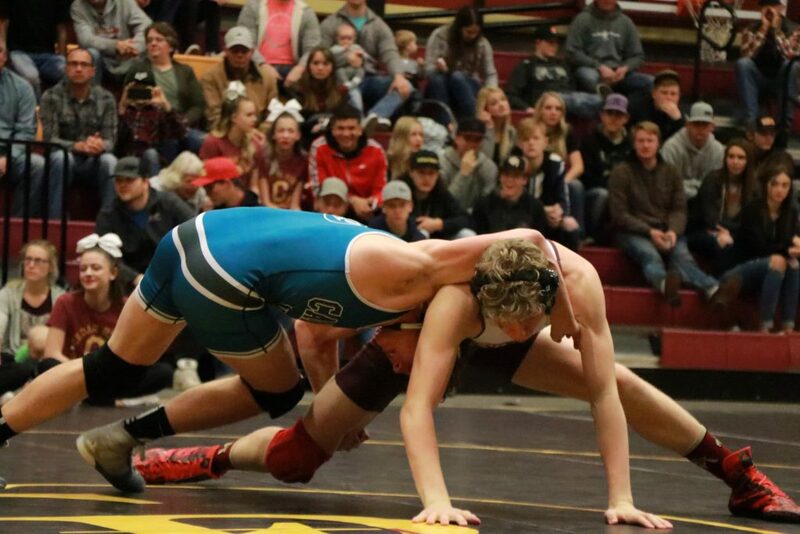 Cavalieri later went 7-1 at the two-day Iron Town Duals, his only loss being a 5-4 decision to Payson senior Tyson Carter. 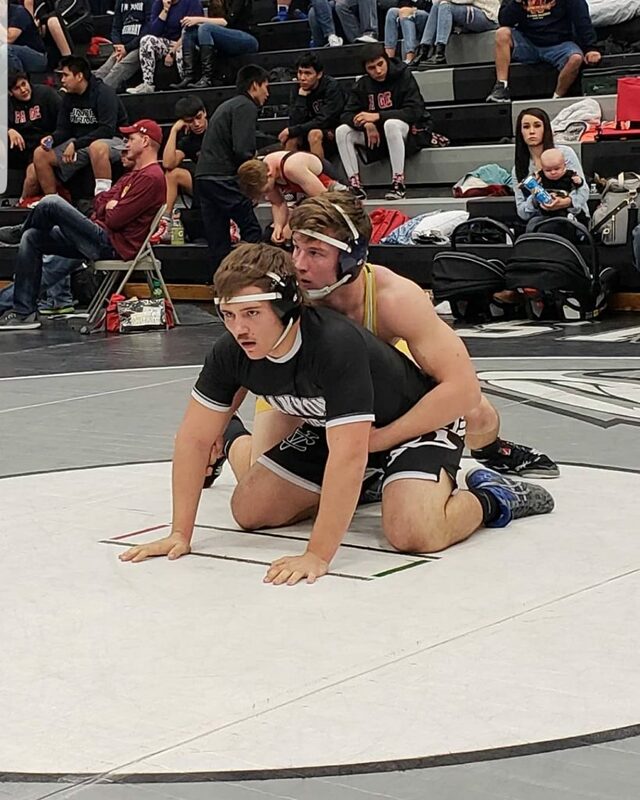 Cedar forfeited its 182-pound match to Canyon View’s Gavin Carter, after which the Falcons’ Alex Allen defeated Cedar’s Payton Murray by first-period pin at 195 pounds. 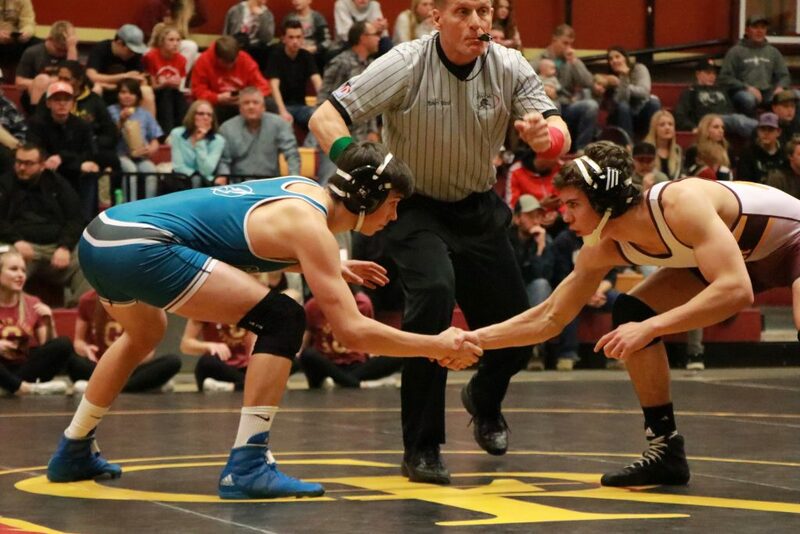 Allen is another returning state placer who previously competed for Kanab before moving to Cedar City, Lowry said. 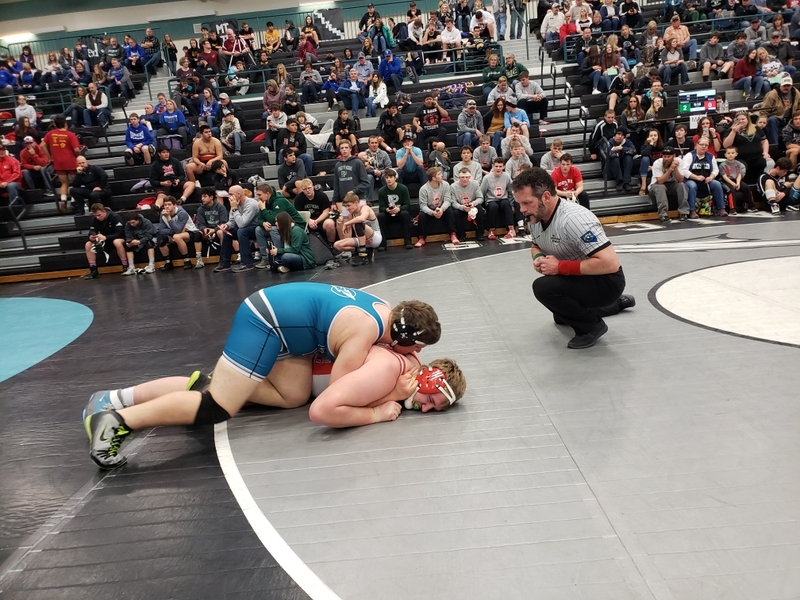 Down 45-21 at that point, Cedar then won both of the final two matches at the heaviest weights, making the final team score 45-33 in favor of Canyon View. 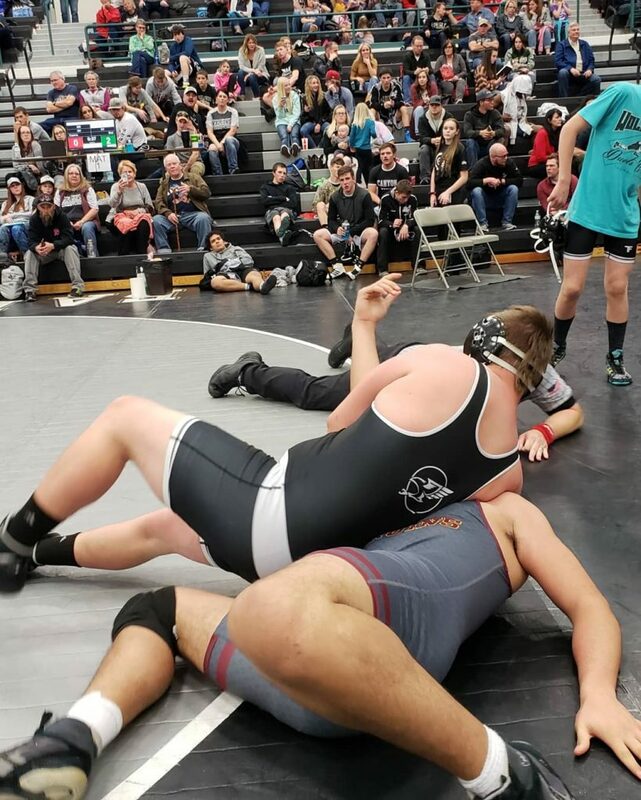 In the 220-pound match, Cedar’s Nathan Ellis defeated Canyon View’s Gabe Blad, while Cedar’s Kioni Alvarez defeated Canyon View’s Riley Robertson in the 285-pound (heavyweight) category. 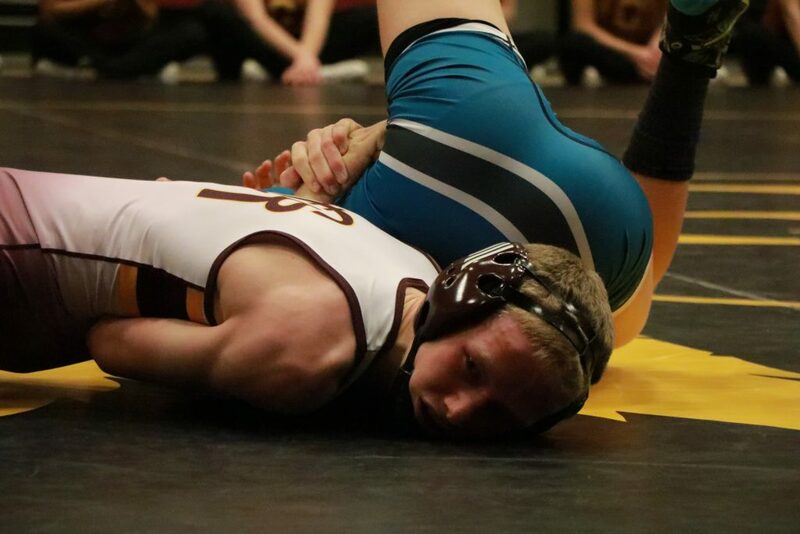 Both wins were by first-period pins. 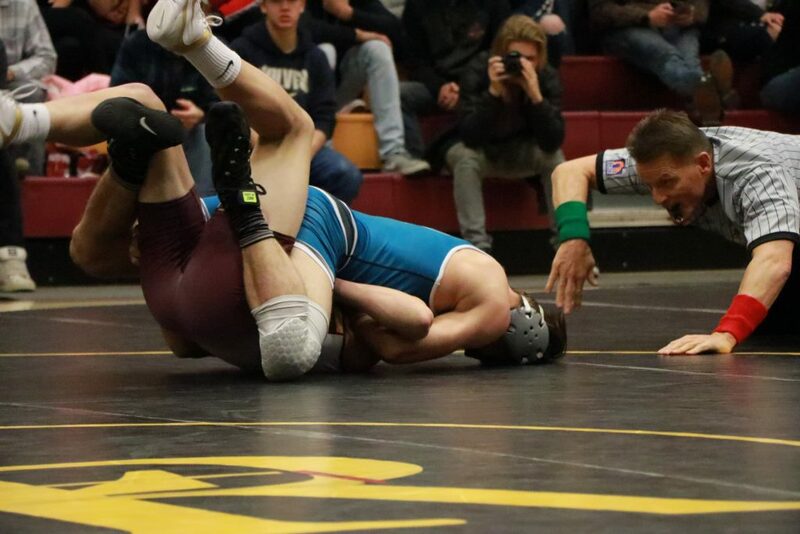 The next day was the start of the 18th annual Iron Town Duals tournament, a two-day event that attracted top teams from approximately 15 area schools, including a few from neighboring states. Canyon View went undefeated in pool play on Friday, defeating Boulder City, Nevada 40-24; Page, Arizona 44-32; Cheyenne, Nevada 63-15; and Mountain View 42-26. On Saturday, the Falcons defeated Beaver 49-30 and Hurricane 45-36, but lost to Delta 40-33 and fell to top-ranked Payson 51-14. 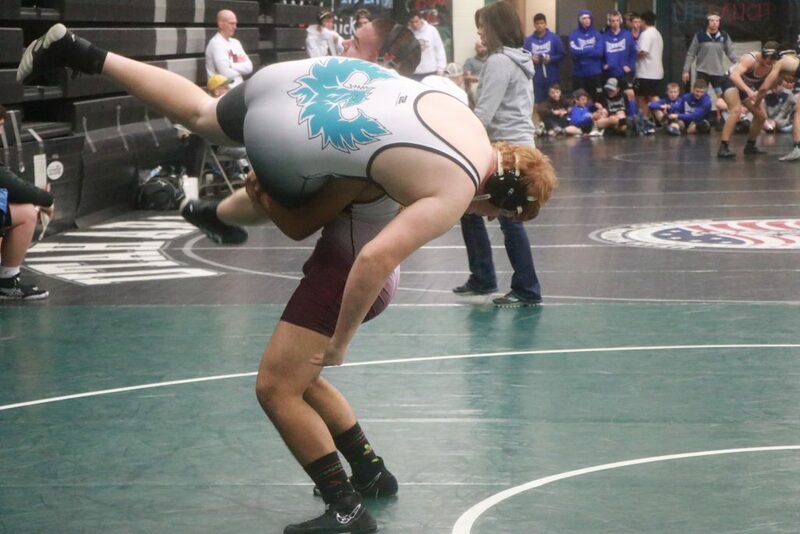 Lowry said that even though Payson went undefeated in its dual matches on Saturday, the Lions didn’t compete on Friday, making Delta the actual winner of this year’s tournament. 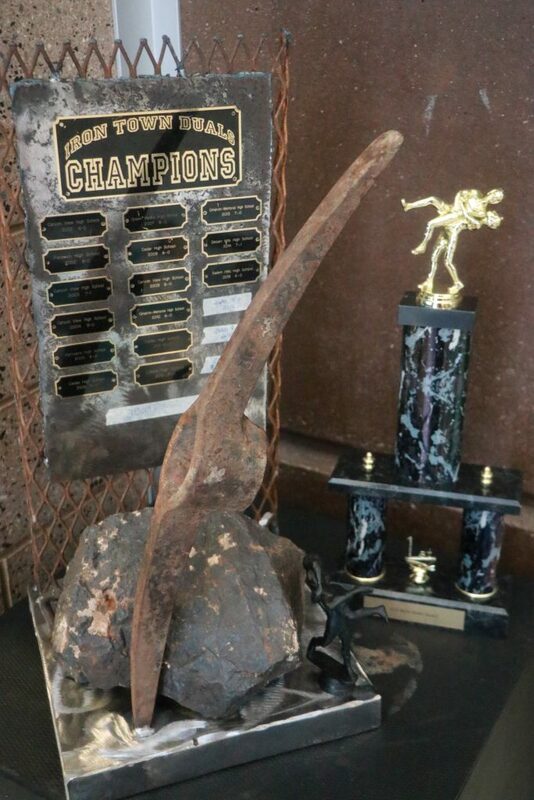 Canyon View, which won the Iron Town Duals last year, ended up in second place this year. Lowry thanked the community for its help in staging the tournament, and for the parents and families of the wrestlers for their ongoing support. 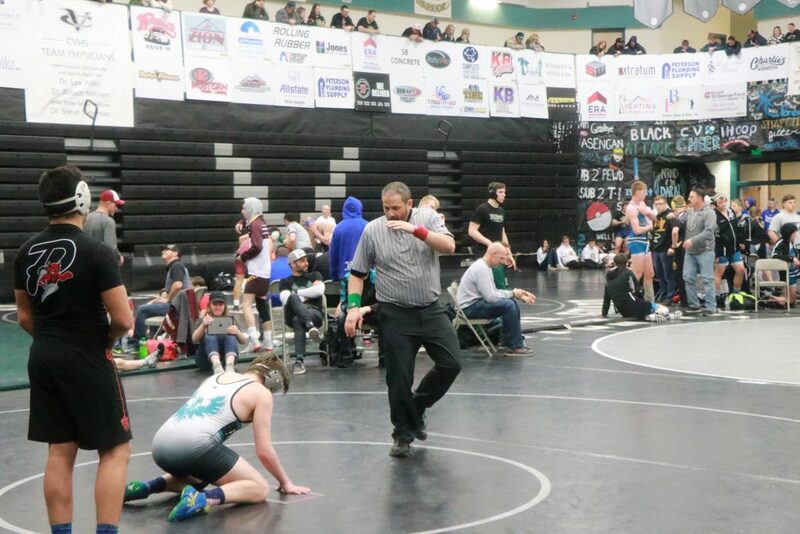 Canyon View, which went undefeated in Region 9 last year and placed fourth at the state 4A tournament, is 4-0 in region dual matches so far this season, with two more left: at home against Hurricane on Wednesday at 7 p.m. and at Dixie on Jan. 24. The Falcons also have a couple other tournaments on their January schedule before they’ll head to the regional qualifying tournament at Mountain View High School in Orem Feb. 8-9. 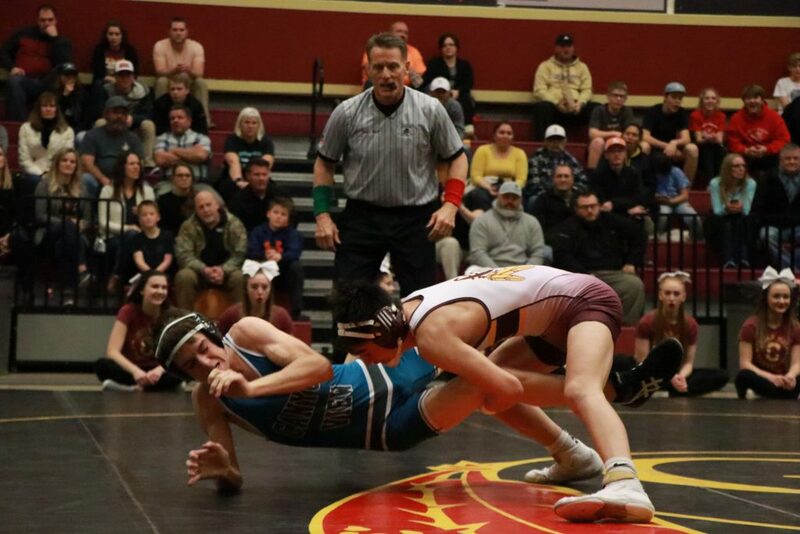 The top eight placings at that event and at the other regional tournament will determine the seedings for the state tournament the following week, Feb. 14-16, at Utah Valley University in Orem.